No, this is not a kayak chop shop for stolen parts to be reformed into a Frankenstein boat. 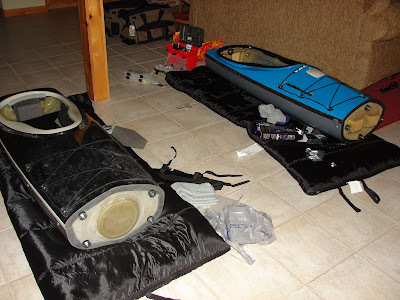 One major advantage of sectional sea kayaks is the ability to easily take the kayak inside for repairs and modifications. The middle cockpit section tends to be where the most mods come into play. Here I am adding a minicell backband to my Aquanuat LV, and I am vacuuming out and adding new rubber washers to the Nordkapp. They will then both be polished. All in the livingroom.